Gail Simone introduces Red Sonja Volume 1: Queen Of Plagues with the declaration that she "might actually be a barbarian lover in a superhero lover's clothing," and that's a pretty apt description of what's on display here. Making the move from superheroes to sword-and-sorcery, she manages to put something of a new spin on the genre. She embraces the silliness of Red Sonja's pulp origins, complete with the gratuitous chain mail t'n'a, but uses it to tell a story that's both solid and mature. I don't remember my Robert E. Howard (or, to be fair, Roy Thomas) as well as I should, but I think Simone may actually do a better job of establishing her heroine's back story. Through a mixture of flashbacks and reminiscing, we witness her childhood, the death of her family, and her life fighting in the pits. It's harsh, and it's cruel, and it's violent . . . and it all helps to define the 'why' of 'who' she is. We don't get as much insight into her sister of the pit, but that shared history makes for a great villain in Dark Annisia. Overall, this was an enjoyable read. Red Sonja 'sounded' right, with her curses and her challenges, and I like that she wasn't the only woman in the world willing to take up the sword. The glimpses into Dark Annisia's madness in the final issue were exceptionally well-done, and are part of what kicked this up a notch from just being another pulp comic. 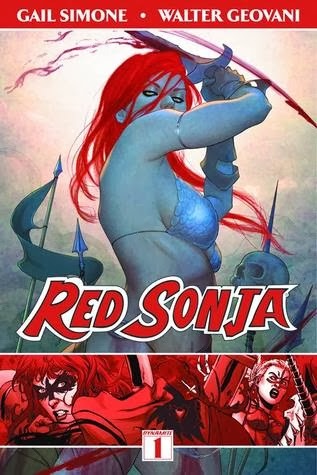 Gail Simone did a fantastic job bringing the character of Red Sonja to the page, and given that Mercedes Lackey just announced that she's joining the likes of Nancy A. Collins and Tamora Pierce in contributing to the ongoing Legends of Red Sonja, I'm anxious to see what comes next. That is a pretty strong cast making this work. I had no idea tis was one of Howard's creations either. learn something every day. She was only in the 1 short story by Howard. It was really Roy Thomas who reinvented her and defined her in the 70s for Marvel Comics.